Leonardo DRS and Rolls-Royce want to offer the U.S. Navy new propulsion and power systems that would give new energy saving and warfare capabilities to the service’s modernized fleet of warships, National Defense Magazine reported Monday. The efforts come amid the Navy’s next-generation FFG(X) program, which seeks 20 new guided-missile frigates. Leonardo is currently working on its second generation hybrid-electric propulsion system for the Coast Guard’s new offshore patrol cutter and the Navy’s FFG(X) frigates. 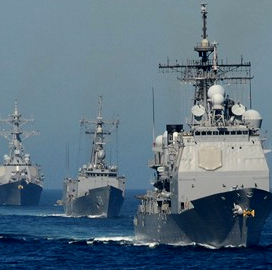 Jamie McMullin, senior director of business development for naval power systems at Leonardo DRS, said the propulsion system will provide greater fuel economy, lower maintenance costs and quieter vessels for advanced warfare operations. Clive Wilgress-Pipe, director of business development for Leonardo DRS’ naval power systems, said using the quiet hybrid-electric propulsion would mainly help the Navy in anti-submarine missions. McMullin said the British Navy is already using a hybrid-electric systems in its Type 26 frigate and South Korea is also expecting delivery of the same technology from Leonardo for the country’s FFX II and III frigate programs. Meanwhile, Rolls-Royce intends to offer the U.S. Navy its recently developed AG9140 gas turbine to supply electric power to the DDG-51 Arleigh Burke-class destroyers. Sam Perez, vice president of customer relations for the Navy at Rolls-Royce North America, said the company designed the power system to be “very quiet” and to provide ships with 3,000 kilowatts of power. Rolls-Royce also wants to integrate the AG9140s into the Navy FFG(X) program, Perez said. Austal USA, Fincantieri Marine, General Dynamics’ Bath Iron Works, Huntington Ingalls Industries and Lockheed Martin are currently designing conceptual ship designs for the FFG(X) frigates under recently awarded contracts from the service.